Anbe Sivam is a film that many people recommended to me and since it stars two of my favourite actors, it was one I quickly moved up the ‘to be watched’ pile. The film has as its basis the themes of politics and religion, but it doesn’t take itself too seriously and there is plenty of comedy along with all the drama. The viewer is taken on as much of a journey as the two protagonists and although the film details their endeavours to make their way to Chennai it’s not just the physical travel which is explored. The film was directed by Sundar C while Kamal Hassan wrote the screenplay and even sang on a couple of the songs. Anbe Sivam has a more unusual storyline for a Tamil film, and although there are one or two clichéd characters and a few unlikely coincidences, overall it’s an entertaining watch. 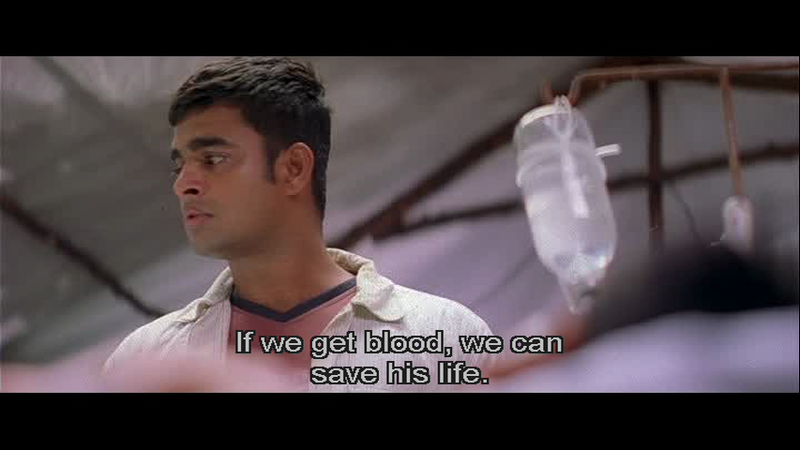 Kamal Hassan and Madhavan make a great team and both give excellent performances. The film starts in Bhubaneswar airport in Orissa where Anbarasu (Madhavan) and Nallasivam (Kamal Hassan) are stranded due to the rains. Anbarasu works as a film maker in the world of advertising and since he despises the part of his name which refers to love, he prefers a shortened from of his name A. Aras. Initially Aras mistakes the bespectacled and physically handicapped Sivam for a terrorist wielding a pipe bomb, when in fact Sivam is armed with nothing more deadly than a cucumber. A.Aras is as much of an idiot as his name sounds. He’s arrogant, quick to make judgments and quite convinced that he is always right. Sivam is a man afflicted with a paralysed right arm, one leg shorter than the other and an abundance of facial scars following an accident. He also has thick glasses and a facial tic which impressively Kamal Hasan manages to keep going throughout the whole movie. 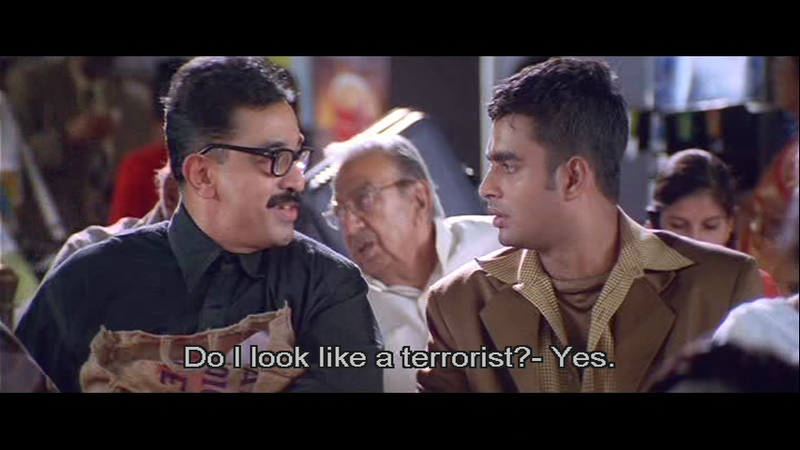 However, after his confrontation with the authorities Sivam explains to Aras that most terrorists don’t look like him at all, but instead are more likely to look handsome like Aras. After all flights are cancelled Aras ends up unwillingly sharing a room with Sivam. Although Aras sneaks out early the next morning he still doesn’t manage to evade his unwelcome travelling partner as Sivam catches up to him in a flooded train station. Again Sivam comes to the rescue of the more impetuous Aras and aids him in his onward journey to Chennai. 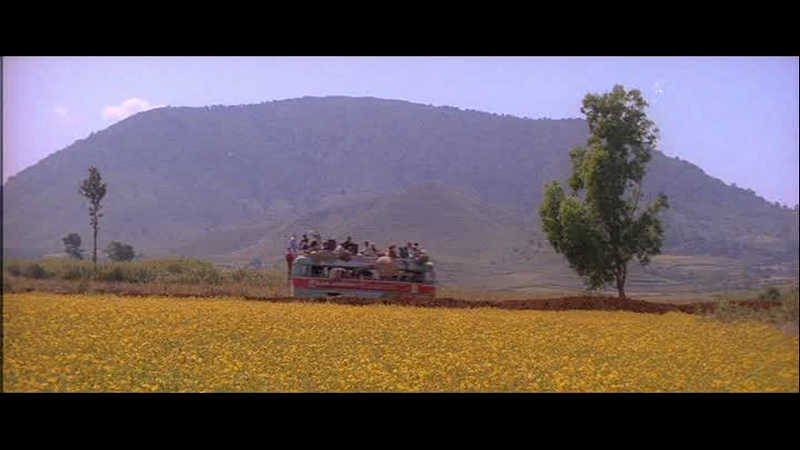 There are some beautiful shots throughout the film and the scenes here of the rain drenched streets and the countryside from the bus are excellent. The duo end up taking a bus and a train on their quest to get to Chennai and along the way Sivam is unfailingly cheerful, chatty and full of unsolicited advice which drives the more reserved Aras crazy. Aras distrusts Sivam and is rude and even callous in his continual attempts to get rid of Sivam, but his efforts backfire every time. This leads to a lot of comedy which, although often quite slapstick, is well-integrated into the story and is really quite funny. The conflict between the two allows discussion of their opposing views on almost every topic but most commonly Sivam’s communist beliefs. The dangers and benefits of globalisation and multi-national companies are touched on while the clash between Aras’s belief in capitalism and Sivam’s in socialism is an ongoing theme. As they wait for the train back to Chennai, there is a long flashback which explains some of Sivam’s beliefs and how he came by his disabilities. An unscarred and healthy Sivam organises and takes part in street plays as a way to spread his message of equality and rights for workers. The main person ridiculed in these street plays is the rich and outwardly religious industrialist Kandaswamy Padayachi who is in conflict with Sivam as he refuses to give his workers adequate pay. Sivam meets his daughter Balasaraswathi and after some initial conflict the two end up falling in love. She persuades Sivam to paint a picture in her father’s factory as the fee for his art work will help fund further communist activity. His painting cleverly includes a large amount of communist imagery and I was intrigued to learn that both this scene and the painting itself were influenced by Diego Rivera’s mural at the Rockefeller Centre. 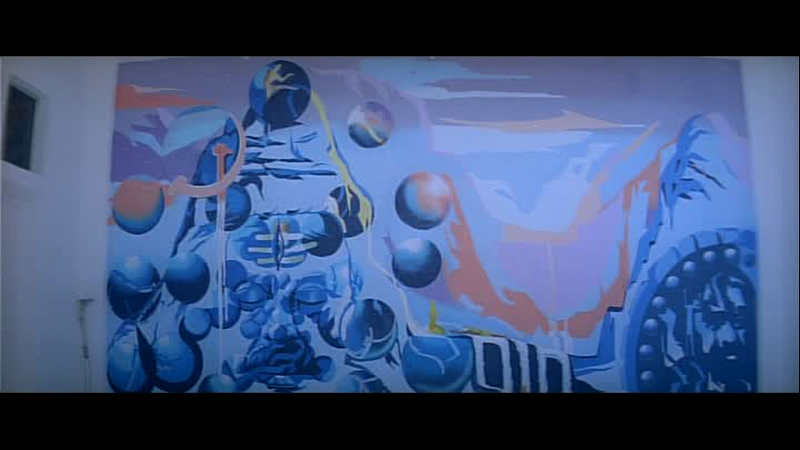 Dolce and Namak’s excellent review notes a number of links between Dali’s work and the imagery depicted throughout the film too. This part of the film is however the least satisfying and goes on a bit too long. Kiran Rathod is rather unsatisfactory as the rich daughter although I can’t decide exactly why, but she never engages any sympathy for her character. The love story seems very trite and there is no chemistry between the two actors here at all.Nasser as Kandasamy Padayachi is a typical evil factory owner although the duality of his evil deeds while continually offering prayers to Shiva was an interesting trait. 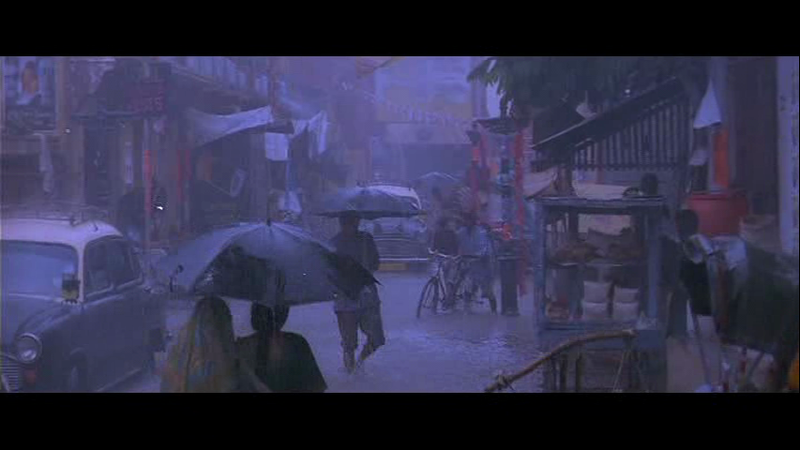 There is a rather odd fight scene with Sivam using an umbrella as a weapon which doesn’t quite fit with the rest of the story although it is well choreographed. An earlier scene where the theatre group’s performance is broken up by the police is much more realistic and convincing, and this later confrontation seems unnecessary and more contrived. However the flashback does give insight into why Sivam looks at the world with his glass half full attitude despite his disabilities. As the rest of their journey unfolds, Aras gradually becomes more compassionate, eventually becoming involved in the struggle to save a young boy’s life following a train accident. Sivam explains his belief that anyone who shows compassion and love to their fellow-man is themselves a god turning the more usual statement ‘God is Love’ neatly around. The last scenes are particularly powerful and moving and Sivam’s unfailing goodness does give the impression that he may indeed be a god. Albeit a flawed and very human one. What really makes this such a good film are the performances from Kamal Hassan and Madhavan. Kamal Hassan plays Sivam with humility and warmth as a basically good man, but one who is not above playing tricks on his travelling partner. He’s also expressive and vehement in his role as an activist but rather more obtuse when it comes to personal emotions. The change in his character as a result of his injuries is very well depicted and despite his many irritating habits, Sivam is a very sympathetic character. Madhavan does well to hold his own against such a performance from Kamal Hassan. He has a great sense of comedic timing and his scenes with Kamal Hassan are compelling. 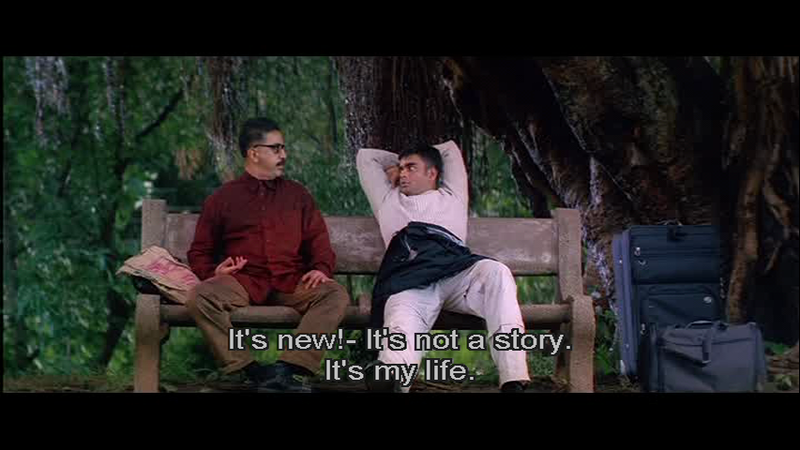 Sivam is the person you really don’t want to sit beside you on the bus and Madhavan’s increasing frustration and anger is understandable and totally believable. His gradual change as he is exposed to the realities of life in rural India is also convincing and well portrayed. Perhaps the only odd note is his sudden desire to adopt Sivam as his older brother as this seems a rather sudden jump from just wanting him at his wedding. The coincidence that both men love the same woman is also a little unbelievable but for the purposes of the story I’m willing to ignore it. Uma Riyaz Khan appears in a small but very effective role as Mehrunnisa, a member of the theatre troupe and Santhana Bharathi is also well utilised as Padayachi’s enforcer. Both characters have more involvement with the story than first appears and I really enjoyed their contributions. The music by Vidyasagar doesn’t stand out particularly but it does fit well into the film and the songs seem to flow very naturally out of the dialogue. The title song, which appears as a recurring theme, is the most effective and haunting. This clip is fairly graphic and does reveal quite a bit of the story around Sivam’s injuries so skip it if you don’t like blood or don’t want to know more about what happens. 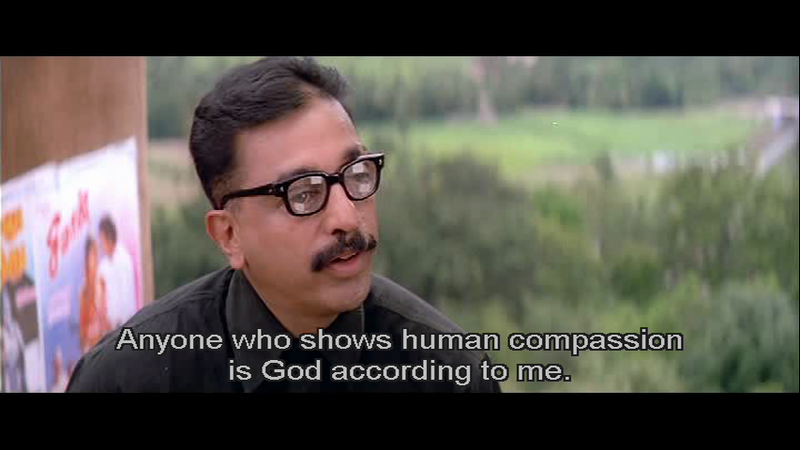 Anbe Sivam is a film I’ve now seen three times and I get more out of it on each viewing. Everything seems to have a second meaning, and that duality is reflected in the fact that the main characters are all known by two different names. It’s a fascinating film and it raises some interesting questions about love and the nature of God. I add my recommendation to all those people who advised me to watch it. 4 stars. This entry was posted in Kollywood and tagged Anbe Sivam, Kamal Haasan, Kamal Hassan, Kiran Rathod, Madhavan, Nasser, Santhana Bharathi, Sundar C., Uma Riyaz Khan, Vidyasagar. Bookmark the permalink. Thanks for bringing this to my attention, it sounds like it uses some of the plot points of “Planes, Trains and Automobiles”, but with a sociopolitical twist and the requisite flashback. 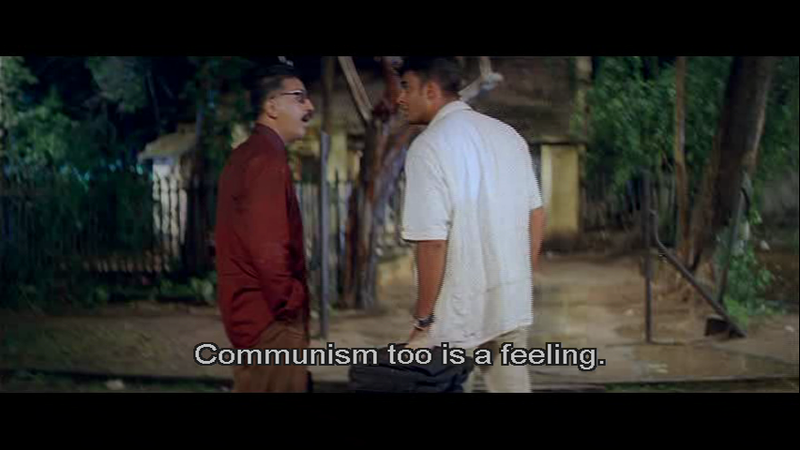 I’ve been meaning to watch “Chalo Dilli”, so I think I’ll watch it in a double feature with Anbe Sivam. I’ve never seen Planes, Trains and Automobiles but from a quick look on imdb and from other reviews I’ve read I think Anbe Sivam takes the basic idea and then goes in a different direction. I watched Chalo Dilli on the plane recently and found it really funny too – perhaps I’m starting to think too much like the average Indian cinema goer (!!!) or maybe film makers are actually taking more care and the films actually are funnier! I suspect that film was mainly made by Kamal Haasan to express his views on atheism/rationalism/socialism and I am grateful that he did this film. The film was awesome and the song “anbe sivam”, which you have linked completely changed my life. The lyrics is so powerful in many levels. 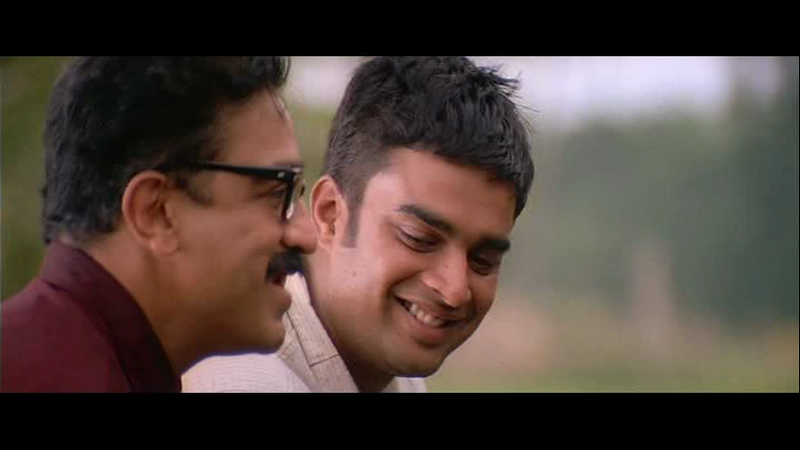 I also thought that madhavan and Kamal had an awesome camaraderie in the film. This film is another example to show that Kamal is India’s greatest living talent! Thanks for the link to the translation – the lyrics are very moving especially considering the scene just before this song where Kandasamy Padayachi is so full of hate (yet still praying to Shiva!!). This song in contrast is full of love and hope and is very effective at this point in the story. I was lucky that my DVD copy did have the translation for the songs and I really wanted to add this one in, even though it is a bit spoilery and perhaps gruesome for anyone who doesn’t like blood! As you said, the relationship between the two men and the way it changes is very well portrayed and Madhavan and Kamal Hassan were excellent in their respective roles. I cannot think of anyone else who would have managed to keep that facial tic going throughout the entire film either! Yay! I finally get around to adding some love to this post, and to also thank you for the shout-out! 🙂 So much love for this movie, even if, like you, I was not too keen on the romantic angle. But then again, it was not a central part of the plot, so I can always fast forward through it next time. It’s definitely one of the deeper Indian films and those are few and far between nowadays, so that’s perhaps why I am even more grateful for having found it. Looking forward to my next rewatch, since I totally agree that it’s the kind of film that gives you something new every time you watch it (I’m only on 2 so far). Lovely post and I hope it gets the movie more eyeballs and more love!! May I commend you for a balanced review about an awesome movie. I’m a shameless Kamalhassan fan (I even liked Mumbai Express) and have watched this movie atleast 25 times. Every single time I watch this movie, I find a nugget I might have missed during the previous watch. There is a lot of symbolism and imagery in this movie, which the ordinary Indian might not identify with, but this movie is a must watch. That still gives me plenty more to watch though! 🙂 I didn’t like the HW film Mrs Doubtfire, which is the main reason I’ve avoided the Tamil version. Thanks for the recommendation of Mahanadhi – it’s not a film I’ve seen but I’ll add it to my list as one to watch even though the synopsis makes it sound rather grim! there are many great films by Kamal Haasan. some that you may not have watched are probably ‘Thenali’, ‘Kalyanaraman’ & ‘Japanil Kalyanaraman’ (old movies but ‘ROTFL’-type movies). Really good comedy. One “discovery” I made while watching the movie for the umpteenth time is the fact that the first few scenes have the color red in some form or the other.This could be just a co incidence or a piece of cinematic brilliance by Kamal. I suspect it is the later. Okay I really enjoyed this review and also the film, in Telugu it is Satyame Shivam(truth is God) I have watched the film with my friends many of them doesn’t like this film as it is quite slow at times. So after knowing that you like the film I’d like to recommend another film of this kind, Kondura / Anugraham is a 1978 Indian bilingual film simultaneously directed by Shyam Benegal , hopefully you enjoy this. Thanks – I haven’t heard about this film.